SWA founder Holly Beck talks about returning to her home in Northern Nicaragua for the first time since protests erupted into civil unrest last spring, causing us to temporarily cancel all Nicaraguan Retreats. I was in Costa Rica running retreats last spring when civil unrest erupted in my adopted home country of Nicaragua. I’ll be honest that even despite hearing from our friends – both local and expat – that now it is all safe and fine to visit, I was just a little bit nervous about coming, particularly since I had two young kids with me. I hadn’t been back in 8 months and had been following the social media accounts of protestors that made things on the ground seem scary. As usual what you see on the news is only a tiny piece of the story. The majority of the unrest has passed. The violence has stopped. Protests are now minimal and confined to the cities. Things look a lot like the US where the majority of the population isn’t happy with their president. Throughout even the worst of the unrest, the beaches never experienced any issues. Now everything is completely peaceful at the beach. The roads from the airport to the beach are free and clear, totally normal. It’s true, I saw it for myself! Many of the Amigas for our January 23rd retreat were escaping the cold hailing from places like Canada, Alaska and Vermont! The majority being first timers didn’t change the fact that we had created full frothing surf monsters by the end! Once a year we pack up all the boards and drive South to Magnific Rock for our annual Southern Nicaragua Retreat. This year we had a very diverse group of Amigas from a few different countries including Peru and Australia. We had pretty small surf which allowed us to surf three different spots. Everyone improved so much! Great conditions, fun waves, and a diverse group of beginners and shredders, it was a super fun week at Surf With Amigas. Here are just a few of the highlights from the week of June 28th 2014. Surf With Amigas is primarily about surfing. We surf when the conditions are best and schedule all other activities around that. However, there’s a lot more to it than what happens out in the water. There’s daily yoga, and all day laughter. Plenty of adventures, horseback riding, jungle hiking, monkey sound making, and good food eating. It’s hilarious, interesting, fun, and addicting! This is the highlight video from our first ever retreat in Costa Rica. As you can see, it was incredibly awesome. We hiked, we danced, we rode horses, we explored the jungle, we did yoga, and of course we surfed! We are super stoked and have decided to make the Costa Rican retreats an annual event. Stay tuned for details on future retreats. 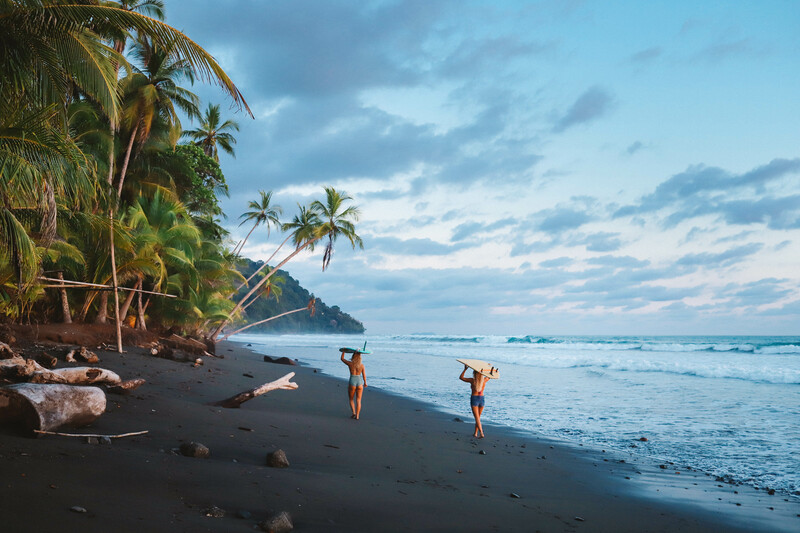 Part two of our January Retreat Highlights package – here’s more surfing action plus some horseback riding and the ladies give back with Waves of Hope by helping to finish the Olas De Esperanza High School project and get it ready for students.